LiveCode LessonsLiveCode LessonsHow to - LiveCode Marketplace Products Data Grid HelperHow Do I Create a Progress Bar in a Column? How Do I Create a Progress Bar in a Column? This Lesson presents how to create a column containing a Progress Bar in a datagrid, using the Data Grid Helper Plugin. First, drag a datagrid onto a stack and double click on it to open the Data Grid Helper (DGH) Properties Palette. Click the "Edit..." button to open Columns Builder. Click the (+) button and add three columns. Name the last column "Progress Bar". 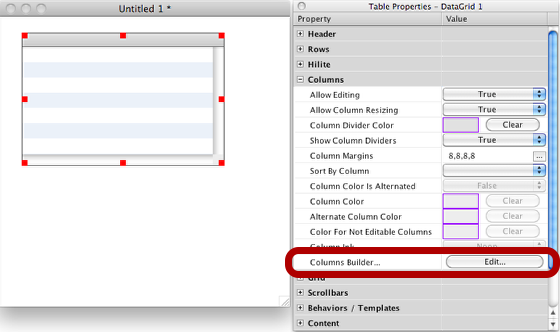 Click the Update button to refresh the Column Builder Preview content (1). A field named "_ColumnData_" will also be automatically added in the Column Content. We have no need of that field in this lesson. Remove it by selecting it's name in the Object List of the Column Content Area (2), after the field is selected in the Column Content, on your keyboard, press the Delete or suppr key. 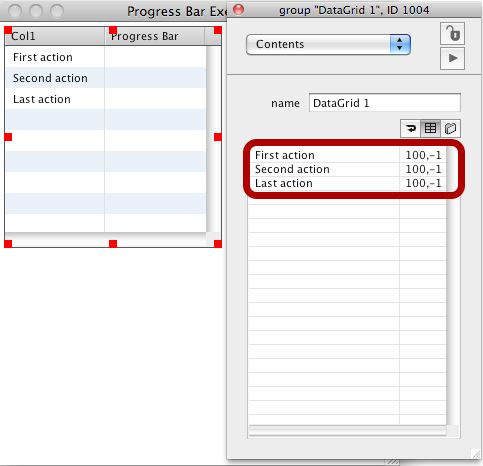 Double clicking on the Progress Bar in the Column Content, will open the Properties Inspector. Input a list of possible values for this menu. DGH can now build the required script for managing this progress according to the column data. Click the Script Editor icon and select the "Build Script" menu. Click the "Update" button to update the script of the column. Click the "Erase" button to replace the column default script with the script built by DGH. After the script is built, update the DataGrid Preview, by clicking the "Update" button. Then, click on the "Apply" button to apply the modifications to the selected DataGrid (1). To test the result, open the Contents tab of the LiveCode's Property Inspector, then input some data. Separate data of each column by a tab, and each line by a return. In the Progress Bar column, note we have input two values separated by a comma. The first value is the max value of the progress bar. The second value is the current value of the progress bar. The ready to use script installed by DGH uses these two values for displaying the Progress Bar. If the current value is set to - 1 the scroll bar is hidden. Any other value (including zero) will display the Progress Bar in the column. For changing the state of our progress bars, we have just to update the values in the progress bar column. 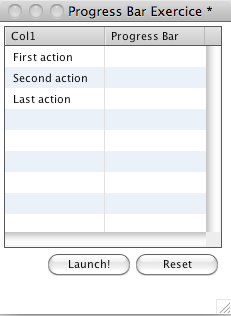 Add two buttons in the card and name it respectively: "Launch!" and "Reset"
dispatch "setDataOfLine" to grp "datagrid 1" with tTheLine, "Progress Bar", "100, -1"
You can also copy / paste the scripts from this lesson. Then, click on each buttons for testing the result. Prev: How Do I Create an iOS Date Picker in a column? Next: How Do I Change the Default Header Behavior of a DataGrid? How Do I Register My Copy of DGH? How Do I Create a Menu Button in a Column? How Do I Create a Formatting Pattern for a Column? How Do I Format a Number in a Column? How Do I Change the Number Format of a Column by Script? How Do I Create a Checkbox in a Column? How Do I Give Color To a Non Editable Column? How Do I Create an iOS Modal Pickwheel in a column? How Do I Create an iOS Date Picker in a column? How Do I Change the Default Header Behavior of a DataGrid? How Do My DataGrid Can Support UTF-8 or Unicode By Using DGH? How Do I Create a Checkbox in a Form? How Do I Change the Sort Arrow Icon Of My DataGrid? How Do I Add Search And Find To My DataGrid Form? What Are The Available DGH Properties For Search And Find Action? How Do I Add Several Columns At a Time In My DataGrid Table? How Do I Add Formulae For Basic Calculation To My DataGrid? How Do I Add A Grand Total Function? How Do I Create A Column With A Word Wrapping Header Text? How Do I Create A Custom Header With A CheckBox? How Do I Create A Column Using A SVG Icon Widget As A Sort Icon? How Do I Add Search And Find To A Table? What Are The Available DGH Properties For Custom Headers? How Do I Create My First Spreadsheet?